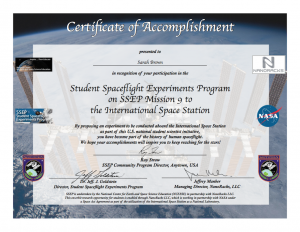 The goal of the Student Spaceflight Experiments Program (SSEP) is to inspire the next generation of scientists and engineers, and engage entire communities in the process. In this vein, we believe that it is vitally important that the thousands of students participating in SSEP Mission 9 to ISS have a lasting recognition of their involvement in America’s and Canada’s Space Program and their role as researchers in real microgravity experiment design, or in public communication through mission patch design. We want them to always remember their part in this program. SSEP Mission 9 to ISS began in 21 participating communities on September 8, 2015, reflecting an expected 13,200 grade 5-12 students immersed in real microgravity experiment design, and an expected 2,860 formal flight experiment proposals to be submitted by student teams. After an intense effort on the part of the 63 finalist student teams and their teacher facilitators, the National Center for Earth and Space Science Education (NCESSE), and the Clarke Institute for Space Science Education for our two Canadian communities, are excited to report that three finalist proposals from each community were accepted by the 10:00 PM ET November 24, 2015, deadline. This process and experience authentically mirrored that of professional researchers submitting proposals against a, e.g., NASA deadline. The SSEP Step 2 National Review Board for Mission 9 is scheduled to meet at the Smithsonian National Air and Space Museum, in Washington, DC, on December 7 and 9, 2015, for tentative selection of the flight experiment for each community. At that point NCESSE will work with the tentatively selected student flight teams to address any outstanding questions based on the Review Board’s comments, and formally lock down the baseline flight configuration of the flight experiments. Formal selection of the flight experiments is expected to be completed by December 17, 2015, in advance of a four month formal Flight Safety Review with the Toxicology Office at NASA Johnson Space Center. The Mission 9 Endeavor payload of 21 student flight experiments – one for each of the 21 participating communities – is expected to launch to the International Space Station in late Spring / early Summer 2016 on SpaceX CRS-10, launching from Cape Canaveral Air Force Station, Florida, adjoining Kennedy Space Center. Clearly SSEP is not a simulation in STEM education. This is immersion in very real spaceflight. In this context, over 13,000 students across America and Canada stepped to the plate, and took on the mantle of real research and real researchers – a stunning accomplishment. We are all – their teachers, their parents, their communities, and the National SSEP Team – very proud of what they have accomplished. 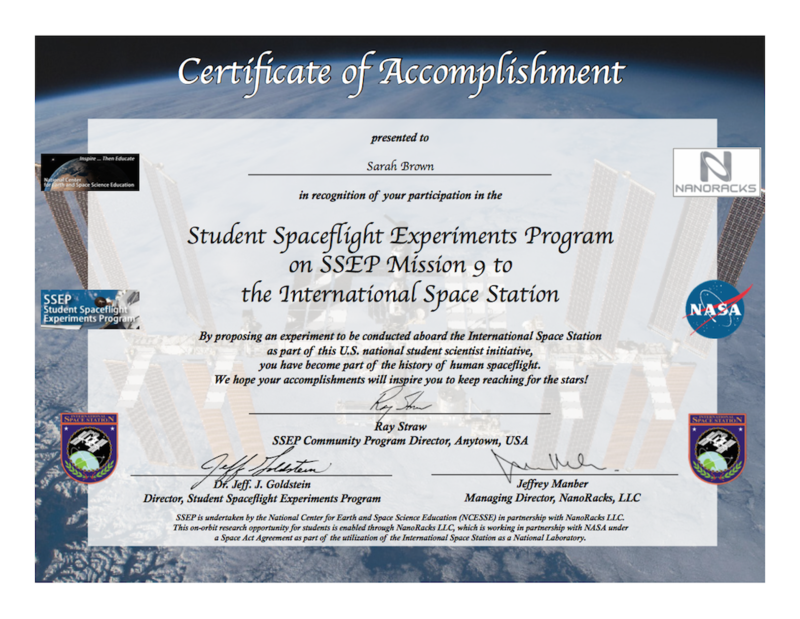 The National Center for Earth and Space Science Education, and the Arthur C. Clarke Institute for Space Education, are therefore proud to make SSEP Student Certificates of Accomplishment available to all Mission 9 to ISS participating communities. NASA graciously granted the needed permission to include the NASA logo on the Certificates even though SSEP is a commercial space venture. We are grateful to NASA for its stunning support of this program since it began in June 2010. Maybe one day, 20 years from now, a Principal Investigator on a spacecraft mission to Jupiter’s Moon Europa in search of life, will look up at her wall of diplomas and see a cherished SSEP Certificate. With a smile breaking across her face, she’ll remember the program that launched her grand adventure. You are invited to look at a PDF sample of all 5 Certificates. The certificates are ready to be printed in color by the community, signed by a community leader, and given to the students that have participated in the program. The certificates include imagery, logos, and ISS insignia, as well as electronic signatures for Dr. Jeff Goldstein, SSEP Director, and Jeffrey Manber, Managing Director of NanoRacks, LLC. Important Note: NCESSE can only make certificate masters available to the SSEP Community Directors and Co-Directors in a community, or to some other designated community leader. We have already sent word out to the Directors and Co-Directors for Mission 9 to ISS as to how they can obtain certificate masters for their community.